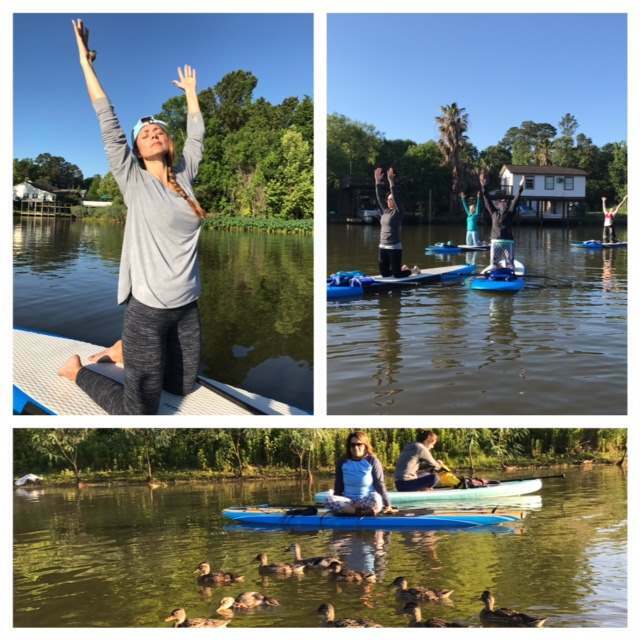 Paddle Board Yoga - Fun or Exercise? Ever think of Paddle board Yoga as a fun option to add to your exercise routine? Well not exactly a paddle sport, but it’s a bit crazy, trying to do all those positions and a floating paddle board? Stand up Paddle board (SUP) Yoga can be a great work out. After all, it forces you to be in the present due to the moving ground below. Unlike Yoga on the beach, where your feet are stable on the ground. SUP Yoga has you on a floating board in water. This will certainly challenge your balance and keep you on your toes. This, clearly, is best done on calm waters. If you are a beginner to yoga and are looking for a challenge. Well, here you go. Finding the right positions and getting comfortable with your board is important to yoga exercising. First, before beginning a Yoga routine, go out on the board a few times and get the feel of it. Not all boards are the same and knowing and testing the limits of where weight can shift is important. This will provide a better overall boarding experience. This is a great experience for anyone, since, you don’t have to master much skill. And, it is perfect for working on the core muscles and improving your balance. There is little risk of injury, since, you will be doing it on water. Should you lose your balance you may fall in, but that shouldn’t harm you. Of course, ensure you know how to swim. 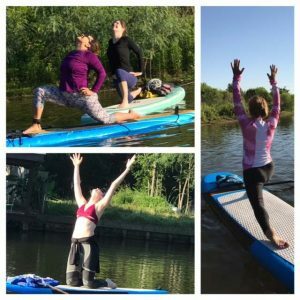 Trying to stay standing up on the board while performing paddle board yoga can be tricky but certainly not impossible. And, there are even groups that offer classes for paddle board yoga, should you feel super adventurous and want to try this with spectators. Can I use an Inflatable Paddle board? Are you are looking to get into paddle board yoga and don’t have a yoga board yet? Have you seen the inflatable boards, but will they work with paddle board yoga? Certainly! All, you need to do is ensure they are fully blown up. Finding one that can handle 15 psi in pressure is also helpful. Look for the board that has the least amount of obstacles on top. Also, you will want to find the right paddle board shape. This is important, as you will be doing more movement on the board than most. In paddle board yoga, you will be shifting weight on the board more different than someone using it to just simple paddle board. This shifting weight can make some boards more tippy than others. We recommend using a stiffer board if possible as well. This gives it more stability in the water. The thicker and longer the board helps as well as it will be more stable by covering more surface. Try to find one that is longer and thicker and that can hold up to 15 psi in air. This will allow you to blow it up harder. As always, the board size is based on your height and weight, however, the general rule of thumb is 10′ -10′ 8″ and have a nose that is 32″-34″ for the best paddle board yoga experience. Grip is another component that should be considered. As you move about the board you will want to be able to stay on. Most boards have a gripping area on top. Ensure this area is covered by the grip is big enough as well, this acts as your yoga mat. The anchor is also an important component to your yoga paddle board. After all, you should be concentrating on your yoga and can lose perception of where you are located. On land, this isn’t an issue, your yoga mat stays put and in one spot. But, your Yoga paddle board moves with the current and if not anchored down, you could get washed out quite far. The anchor should hold you in place firmly so this doesn’t happen while you enjoy your paddle board yoga experience.